These DIY storage shelves are a really simple solution for storing your stuff easily and without breaking the bank. We all have things we need to store and keep organized so we can find it when you need it. I've found that storing your things in tubs on simple storage shelves made with 2 x 4s and OSB is the easiest and most efficient way to keep you storage accessible. So, how do you store your stuff? 1. Assess Your Space and stuff to be stored. When organizing a room, I assess what is kept in the space. This means measuring everything. This storage room had two storage shelves in it before, but the shelves weren't spaced correctly and stuff got piled up. I store almost everything in 18 gallon Sterilite (made in America) plastic tubs or totes. Most of my stuff fits in these plastic containers. There are also clear containers if you would like to see what's in them. Here's what the basement storage room looks like. The room is about 15 ft x 11 1/2 ft.
Mr. DIY reused all of the materials from the old shelving units and bought some extra 2 x 4's to make a 3rd shelving unit. Even if you had to buy all of the wood, these shelves are still a cost effective way to store your stuff. Have you seen the price of sturdy shelving? These shelving units are simple to make. He just used two 8 ft long 2 x 4's and cut two more 2 x 4's down to 24" for the ends. The total length of the unit is 8ft, so the long 2 x 4's have to be cut down a little because you are adding the short 2 x 4's to the end. He screwed them all together as you see in this photo. Screws are so much better to put shelving together because this allows you to take them apart if you have to rework them another time. It would have been much more difficult to take apart the old shelves to make the new ones had he used nails. Mr. DIY used torx head, 3" self tapping deck screws. Mr. DIY then screwed 1/2" thick OSB to the 2 x 4 frame. He made 3 of these for each unit. Then he attached 2 x 4's on each corner to complete the unit. The shelves are spaced the height of the plastic storage boxes we have plus 1 1/2 to 2" extra space. These shelves are super easy to make and are inexpensive, as far as shelving goes. He made this shelving unit a little shorter so that the plastic storage containers could be double stacked on the top shelf. I organized this shelving unit to hold my girls childhood toys, books and clothing they wanted to keep. The clear boxes on the bottom right hold their artwork and school mementos. The shelving unit on other side of the room holds Christmas and seasonal decorations. The armoire holds hunting clothes and heavy winter coats. We found the Ikea Armoire on Craigslist. If you don't have a basement and are limited on space, store stuff under beds, high up in closets, space under sofas, your garage and attic . At our new house, we have a high crawl space instead of a basement, so Mr. DIY built a different shelving system to store our stuff. You can see it HERE. Where do you store your stuff and how do you keep it organized? Leave me a short comment (or a long one) - I read every one! Click HERE to see how we cleaned up and organized our garage. Our storage shelves above would we awesome in a garage, as well. We took a Craigslist Armoire and transformed it into lots of storage for our oldest daughter. Disclaimer: The above post is how we made our shelves. We don't take any responsibility for any errors or results obtained from using this information. When using power tools, use safety equipment. He outdid himself again and so did you! This is my dream for our storage room in the basement!! One day....It must feel so good to go in there now and know where everything is. This looks great Pam. If our house doesn't sell and we decide to stay here, I want to do this in our basement. It really needs organizing. A storage area like that might just be what sells your home. Any little item that helps set your home apart/memorable may either be what makes your home the one to buy, or sticks in the memory and brings people back for a second look. After Hurricane Issac I'm sort of doing this in my attic- after sorting through wet cardboard boxes. I would kill for a storage room though. This looks great and NEAT. It's awesome! Nothing like going to find something, and being able to :) Perfect timing too, you'll be all organized for the holiday! Mr. Fantastic is living up to his name there. I use clear plastic bins with locking lids, under the beds (4), in a closet, and under a hutch I need to make a curtian to hide. Saw this on Hometalk - GREAT job!!!!! I have about 50 of those plastic tubs all stacked up in the garage, sunroom, spare room, etc. I need some shelves like yours! Looks awesome!! I wish my storage shed looked this good! Great job! Ooh, my goodness--that transformation feels good just looking at the pictures. I LOVE how orderly that space is. Congrats and nicely done! 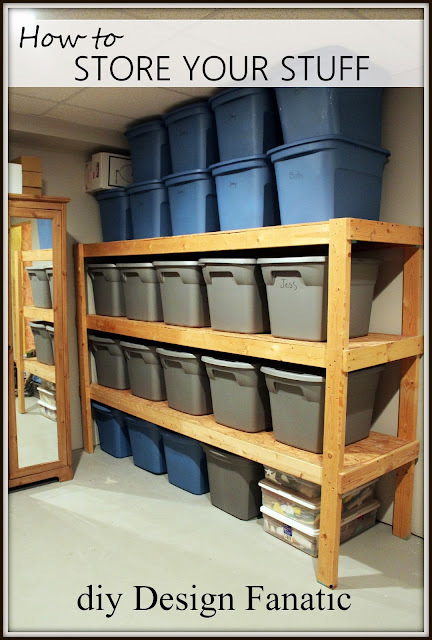 This post makes me want to tackle my basement storage area! That is some serious organization Pam! I'm so impressed! UGH..Pam you put me to shame. THanks for sharing at my party. I have been actually organizing too these days. I have a ton of those rubbermaid tubs stacked in my garage, but I am terrified of them collapsing! Death by Christmas ornaments!!! Anyway, thank you so much for this idea, I e-mailed it to my husband. You're blog is awesome, I'm adding it to my reading list :) Have a great weekend! Anonymous, my husband used torx head, 3" self tapping deck screws. Good luck with your shelves! WHOA! Did your hubby and my hubby come up with this together? Our shelves look almost if not identical. Craziness. I love them as well. I don't know what people do without this awesome kind of storage. Thank you for posting this ... it is an answer to prayer!!! I plan on buying a storage shed next year. In the meantime I have packed all my Christmas decorations, yarn, etc in these plastic tubs. I have them stacked 5 high in my guest bedroom. My problem is, because of the weight, the bottom boxes keep collapsing. I have not been able to find a shelf big enough to hold them anywhere at any price. THANK YOU FOR POSTING THIS SHELVING UNIT!!! This is awesome! May I pin this? I have a storage area in my basement. I put everything in boxes and number the boxes. I have a separate inventory list that tells me what's in each box. That way I don't lose anything. However, my boxes aren't as pretty and matched as yours! I was just trying to explain shelves like these to my husband yesterday! So happy to run into them today on pinterest! Thanks for the great step by step...hopefully I'll have a set very soon! Are your shelves attached to the wall for support? or Are they free standing? I love the way your shelves look. TazCRNA, I couldn't respond to you by email because you have "no reply blogger" checked on your settings. The shelves are not attached to the wall. Attaching them to the wall would be an excellent idea, especially if you live in an area prone to earthquakes. Can you tell me how far apart these shelves are spaced? I Love them! @ Anonymous, the space between the shelves is 18 1/2" apart on the left shelf and 17 1/2" apart on the right shelf. I also use NACKit! pockets and cards to label the bins. My bins looks uniform, and I know what's inside without digging. Love the shelving units!! Just what we need. Does it matter if the lumber is treated or dimensional? Why OSB vs plywood? Just asking of the experts. Thanks. treated wood is meant for outside only, and OSB is usually cheaper. Danielle, I wouldn't use treated lumber for shelves. We used OSB because we took apart the shelves we had and that's what those shelves were made of. You could use plywood, as well. Wht wouldn't you use treated lumber? I'd like to have something similar, but it would be in my garage. @Rich, plywood is always better and stronger, but we were reusing the osb that we had. 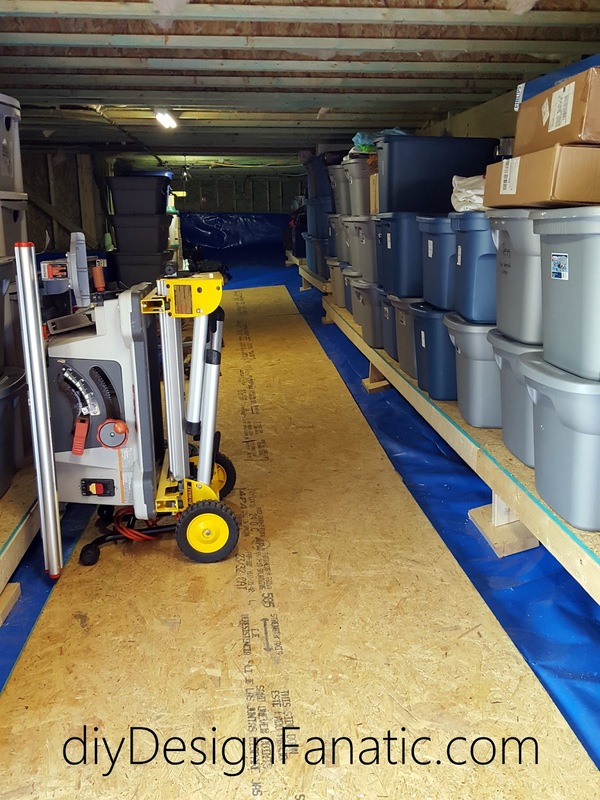 Our basement is a walkout basement or a lower level with windows on 3 sides and we keep the humidity at 50% and we don't have moisture problems. The floor is also painted with a thick floor paint, as well. My husband made three of those shelves in our basement. Now to get bins on them like yours! Thanks! Hi Pam! How tall are your ceilings 8ft? thanks! Do those measurements accommodate 8ft ceilings? thanks! We only use treated lumber when it building codes call for it because treated lumber is treated with poison and gives off gases. We re-used the lumber that we had for this project. Pressure treated lumber use to be treated with arsenic but it has not been for some time. It is treated with copper and Borate the same chemical you may use to wash your clothes. You should use pressure treated lumber anytime it is in contact with concrete, dirt or excessive moisture. The ceiling in this storage room is 8 ft. I agree that if you have an abundance of storage space but do not carefully utilize it, you might just end up creating more mess than a person with limited space would. It is crucial to always organize your stuff for easy retrieval in future. Not only will you be at ease when searching for something, but your living area will be neat and tidy too for your own peace of mind. I love the DIY storage tubs that have been created. Not only does it save money, as compared to buying ready made storage containers from stores, but the DIY tubs can also be customized to fit our own required dimensions. This is depending on the shelves you have and also the storage room size. This way, you can ensure that everything is in place and no items are left lying bare outside and not inside neatly in a tub. storage rack are durable and holds the maximum weight .These racks are useful to store large warehouse products.Mostly its used in all industries . Great job! So much easier to access. Wish I had a space like that. Hmmm, perhaps I could do something like that in my attic. It would surely limit clutter. Just a thought on the construction: I think I would put in 1 or 2 support pieces in the center of the shelf frames so they wouldn't get 'saggy'. Hello, I hope you get this comment. I love these, I am a single mother trying to figure out how to keep things sorted and accessible. I hate having to move one box to get to the next then things get knocked over dug through and misplaced. I did a bit of house removations with my grandparents on their rental properties so I have the basic knowledge on this and once I have everything will do fine. I was just wondering if you could tell me What size pieces of osb do I need to get and how many. Also how many and what lengths total of 2 X 4's. I just don't know what they come in and want to make sure I have enough but not too much scrap. Thank You soo much. @ Simba1133, you have no reply blogger checked, so I couldn't reply by email. We made our shelves from pieces we already had,but I found a great post that lists exactly what you need. You can find it here: http://www.whitehouseblackshutters.com/how-to-make-a-basement-storage-shelf/ . Just copy and past it in your browser. hope that helps. I noticed that the shelving on the left of the closet and the right are done a bit differently for the ends, could you explain that a little for the reasoning behind? The one on the right where there is an end piece I beleive to secure the shelves to the legs seem to be stronger, was that the idea? @ Mert Karakilic, The reason the shelves are a bit different is that we were using parts of the previous shelving and decided to make the one on the left longer to maximize the length on the wall. Thanks for the idea! We couldn't be happier with the result. The added support from the OSB really strengthens the shelving up nicely. You made our day! How much weight can each shelf hold? Hey Joy, You had "no reply blogger" checked so I couldn't email you back and I hope you see this comment. We're not sure how much weight each shelf can hold, but if you are going to put really heavy things on your shelf and are concerned, you could always add 2 more supports in the center. So about how much $$ did this project cost? I am completely out of my element here but badly need shelves like this in my garage... thinking I just might attempt this project!! @My Hope, you have "no reply blogger" checked, so I couldn't respond to you through email. I didn't say how much this project cost because we reworked some shelving we already had, but my husband just made another shelf for another space a couple of weeks ago and his supplies came to about $85. He already had the screws, so the total should be a little less than $100 for an 8ft shelving unit. So sorry Melissa for deleting your comment. I was on my tablet and when I pressed publish, it moved and I accidentally pressed delete! Hey Melissa, the posts are 6 ft, but we made another shelving unit where we left them 8ft and added another shelf. You can make them any length you want. Made two of these for my basement. Instructions were easy to follow and the project was quick. It took about 1-1/2 hours a piece to make these, from start to finish. My basement is now beautifully organized thanks to these shelves. Thanks for the instructions! Cost in WI was about $70 each, buying from the local lumber store rather than a big box store. Of the hundreds of plans online .. i choose yours, however I am going to try to make mine with 7/16" OSB and 2x3's. I am hoping it is just as sturdy. Wow...!! really a nice post and loved to see it...!!! Nice ideas to use in the basement remodeling tasks...!!!! Hi! I love this project! If we bought plywood that is 2'x2', do you think the shelves would still be just as sturdy? We don't have a pickup truck and I don't know if 2'x8' plywood will fit in our Honda CRV. Lol! Thank you! Thanks for sharing wonderful idea to store your stuff. Your post is very useful for me because my stuff is scattered everywhere in my house. I like your idea for keeping my stuff on shelving. Shelving makes my home more attractive. I would recommend putting http://seed.io tags on each of the bins. This way you can take photos an make lists of what is inside and edit them over time. When you write on the bins it is difficult to change, but with the stickers you can look into the bin without having to go and get it down. It saves a lot of time and effort especially when you are away or the bin is on the top shelf. Love love love this idea! I'll show it to my dad today to see if he can help me. I plan on selling my condo in the near future and although I hate to leave it behind I think it can only be viewed as a plus in my garage, plus it means that I have less to put in storage. Awesome work btw! Very impressive! Other thought was that after doing it once here it would be that much easier the second time at my new house! I'm really excited about making these! My dad mentioned something about moisture in the basement. How have they held up so far? I was wondering if the material degraded at all. He suggested I but plastic, but I'd rather make these! Thanks. I have a walkout basement with a dehumidifier. We don't have a problem with moisture at all. The material has held up very well and hasn't degraded at all. If you have moisture problems, you would have mold throughout your basement. Even then, I think it would take 20+ years for the wood to degrade. The mountain cottage we bought had a moisture problem in the crawl space due to no gutters on the hosue and leaks in the bathroom and the wood joists below the bathroom need to be replaced. The house was built in 1986. That's how long it took for the moisture to degrade the wood. My friend and I made one of these storage units for my garage today. It turned out great. Thank you so much for the great idea and directions. Amazing! Just the shelves we need :) I assist in a group that helps individuals and families with clothing and other donated items. We are having a fun time organizing it all into a garage for being able to have our meets this winter. These shelves would make the garage complete! Thank you! Using containers and labeling them is the greatest idea. My attic is in the same condition like your second photo. It desperately needs organizing. Thank you for sharing such an useful article! Greetings! I love this easy idea of creating storage where there currently isn't any. There are so many places in my home that are above the floor that can be used as storage space. I just need to find the right sort of shelving or cabinetry that I can install along the wall. I have an 10 ft. by 12 ft. shed that is piled high with large to small plastic containers which my wife has o move around whenever she is looking for something. I built two of these storage shelves, one for the sort side wall and one for the long back wall. I also moved several of my woodshop items back into my shop and built three of these shelves to store my shop items on. Now my wife is happy and it makes my life in my Basement shop so much easier to find the items that I thought was lost. Thank you so much for this idea. Everyone should use this idea to get organized. Thank for sharing your fantastic thoughts for storing stuff. The plastic container you've suggested is a very good idea for storing. I'll definitely use your idea. Do you know, roughly even, the weight limit of each shelf? Storing your possessions in a self-storage unit or in a separate storage area in your home, can be quite a benefit to you, since they help keep you organized and help lessen the clutter that you have accumulated in your home. Oh - this is so wonderful and I even feel like this is something I can handle myself! Thank you! Now I have to check out your other stuff. A very efficient technique indeed! Although I'd probably use some labels for those boxes so that I could remember where everything was. Thanks for sharing this! I have a similar storage area in my workshop where I put on my woodworking and gardening tools. Believe me, those labels help A LOT! Sooner or later you won't have enough bins to store "all" the kiddo's papers, toys, etc., I think being organized is making sure you won't have that many bins of kids stuff to store. It does look lovely! Thanks a lot for sharing. These labels really help me lot to organize my tools. These are the exact style shelves that I want my husband to build in our attic as well. They're totally sturdy and have a ton of space for all of our totes that hold holiday decorations etc. I don't think we can get 3 shelves up there, because height is an issue, but even 2 levels will be awesome. We have very little storage. So we want to put this type of shelving in our laundry closet because it will be extra sturdy. We also have to work around the water heater that's at one end. It's more challenging than making rectangles. Wonderful! A very efficient technique indeed! Thanks it helps me a lot. Loved the way you've organized things using those plastic containers. I think one of the most important aspects of making any shelve is to see its usability rather than its design. Your updated shelves also look very prim.